Round one of the Stanley Cup playoffs is over and all the matchups for the second round are set. The Bruins will take on the seventh seeded Philadelphia Flyers with the series starting on Sunday. But before I talk about the next series, I need to discuss what went on in the first series against the Buffalo Sabres. The Bruins finally played hockey but they still did not play 60 full minutes. The Black and Gold trailed in every game except game 6. This was nothing new for the Bruins. It seems like every game this season and now postseason, they have had to battle from behind. Somehow, the Bruins hunkered down in games 2, 3, 4, and 6 to take the series from the higher seeded Sabres. The first round featured the return of the Michael Ryder that we all know. Ryder scored two goals against Buffalo and overall just looked better. He was making plays and actually showing up to play. The third line of Ryder, Sobotka, and Wheeler played great in the first round and game 6 may have been the last time those three skate on a line together this season. Mark Recchi led the team with three goals and two assists and look for more of that veteran presence in the second round. Everyone stepped up in the Buffalo series. Satan regained his scoring touch and when he is on, he is on but then again when he is off, he is off. The defense got a boast with Ference returning in time for game 1. With Ference, the backline looked solid along with Chara, Boychuk, Wideman, McQuaid, and Hunwick. The blueliners still had some weak moments but overall they looked better than they have all season. Rookie defenseman Adam McQuaid kind of flew under that radar in this series but that isn’t necessarily a bad thing. It means he didn’t do anything wrong and on top of that, he actually played well. His big body was clearing out the net in from of Rask when needed and played intelligently. I cannot remember an instance when he made a mistake that costs the Bruins. For his first NHL playoff games, McQuaid certainly held his own and the Bruins certainly will need that to continue in the second series as they will still be without Stuart and Seidenberg. With the Bruins not being completely solid in front of him, Tuukka Rask needed to play his best in order to keep the Bruins in the Buffalo series. Rask was outstanding against the Sabres with a 2.18 goals against average. On top of his .927 save percentage, Rask also assisted on Satan’s game-winning overtime goal in game 4. You can’t beat a goalie that can save goals and help your team score goals. Sorry Timmy but don’t expect to see time this postseason. So now onto the second round. Near the end of the season, it looked like Boston was either going to get the Capitals or the Penguins in the first round and the Bruins managed to move into the sixth spot and get the Sabres. As the first round series were ending, it looked like the Bruins were going to the Penguins. That isn’t going to happen either. The Canadiens pulled out a stunning upset over the number one seeded Capitals and they will take on the Pens. 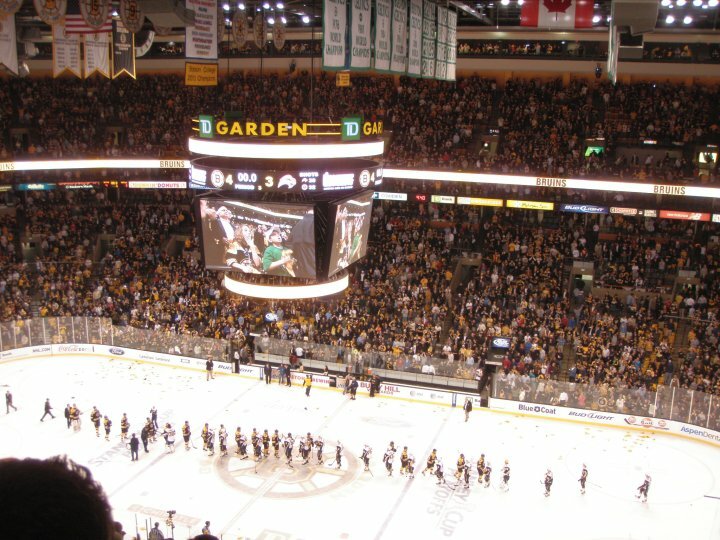 With all this said, the Bruins will take on the Flyers and will have home ice. I think most people were looking forward to a Boston-Pittsburgh matchup with Marc Savard cleared to play in the next round but it won’t happen. Despite the fact Savard won’t be able to get revenge on the Pens on the scoreboard, the Flyers series should still be a good one. Expect much of the same out from this series that we got in round one. The games should be close and most likely gritty. Flyers’ Hartnell and Carcillo will probably try to mix it up with the Bruins. The bad part about that is the Bruins will probably be without Shawn Thornton who will most likely be out of the lineup once Savard returns. I wouldn’t be surprised if McQuaid decides to throw down with a Flyer. My prediction for this series is Boston takes it in seven games. I expect there to be close games including at least two overtime games. Repeat of the Winter Classic anyone? The Flyers will also have over a week off between their series and how whether they can maintain their competitive edge will play a big factor in how they perform in this series. That’s the excuse the Bruins used last year and let’s hope the same holds true for the Flyers this year. In February, who would have thought the Garden ice would still be frozen in May? I got to say I’m a little surprised but it is a good surprised and let’s hope the Bruins can keep it going for a little while longer. Nothing beats playoff hockey at the Garden.